You know that feeling when you get an unanticipated gift in the mail? That’s what I was feeling last week when a box arrived via courier. 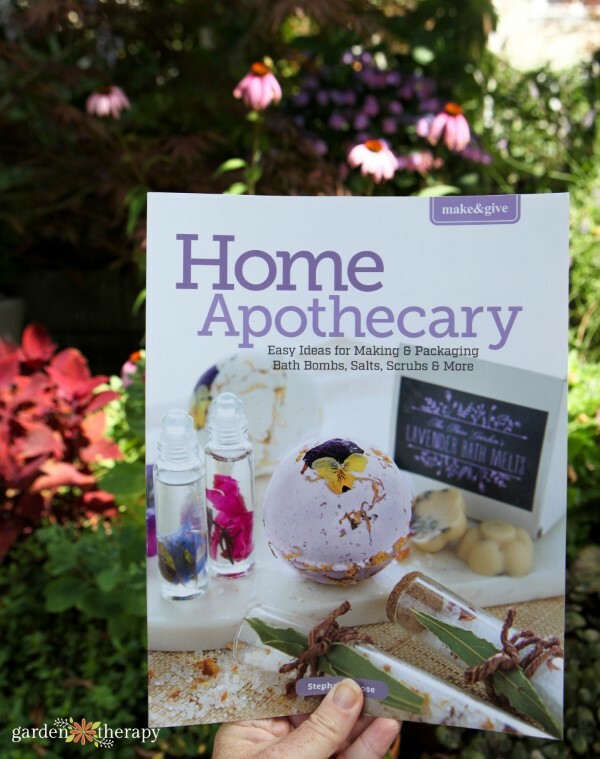 When I opened up the box I was truly surprised to see it was my brand new book: Make & Give Home Apothecary – Easy Ideas for Making & Packaging Bath Bombs, Salts, Scrubs & More. This book was a bit of a whirlwind. I was contacted about writing it just a few months ago and now it’s being released! My first book, Garden Made, took 18 months from the time I delivered the manuscript to print. This new book is on a fast track to get it into Michaels stores for August 10, 2018, so it was rushed to print. As of today, it’s being rolled out in a few places and I can’t wait to share it with you! 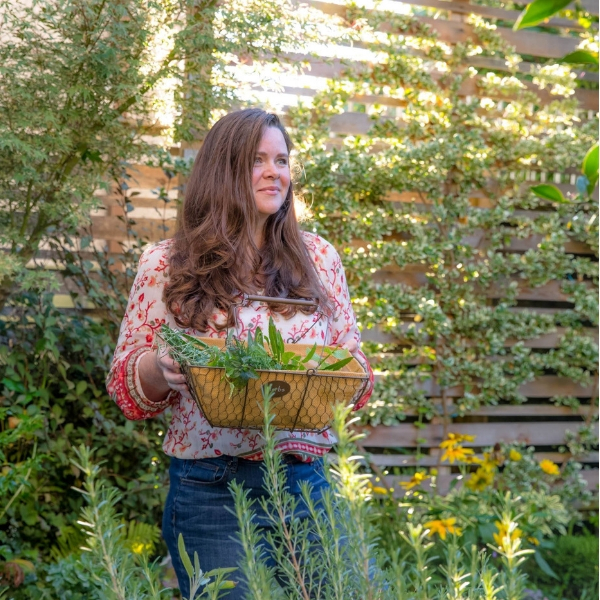 I have a few signed copies and some bonus items to send out to celebrate the launch, so be sure to check out the listings in the Garden Therapy Shop for more info on how and where to buy it. This new book is part of the Make & Give series that’s being created by Leisure Arts. 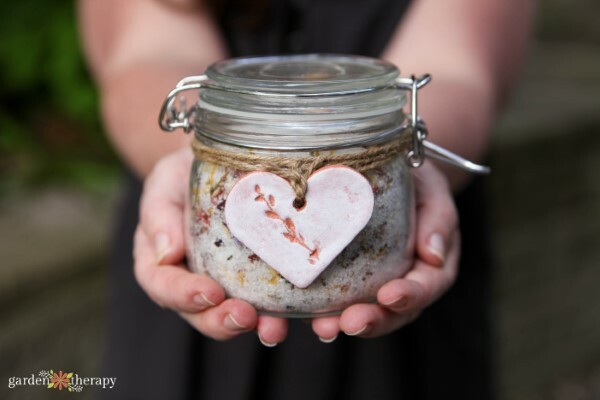 Make & Give Home Apothecary is all about using garden-fresh botanicals and herbs to craft up beautiful plant-based bath and skincare products at home. 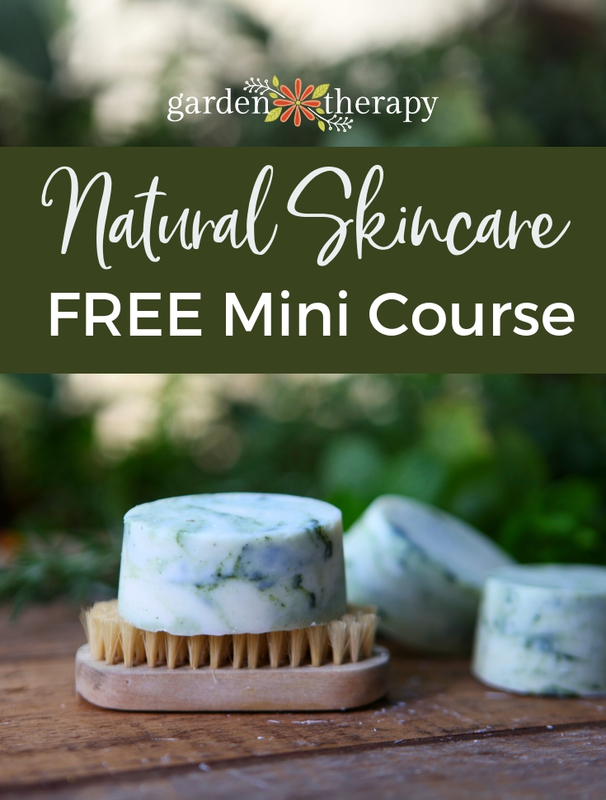 I used ingredients grown and harvested from my garden and all of the supplies from my home apothecary to make up 12 gorgeous foundation recipes that can be a jumping-off point for hundreds of custom creations. The recipes are fully visualized with photos showing the step-by-step instructions from measuring the ingredients all the way to packaging. 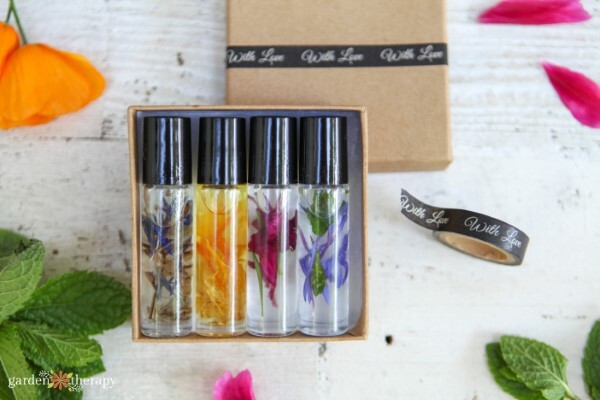 But the best part is that you can follow the steps exactly or you can add your own creativity by switching up the botanicals and essential oils that you like best. 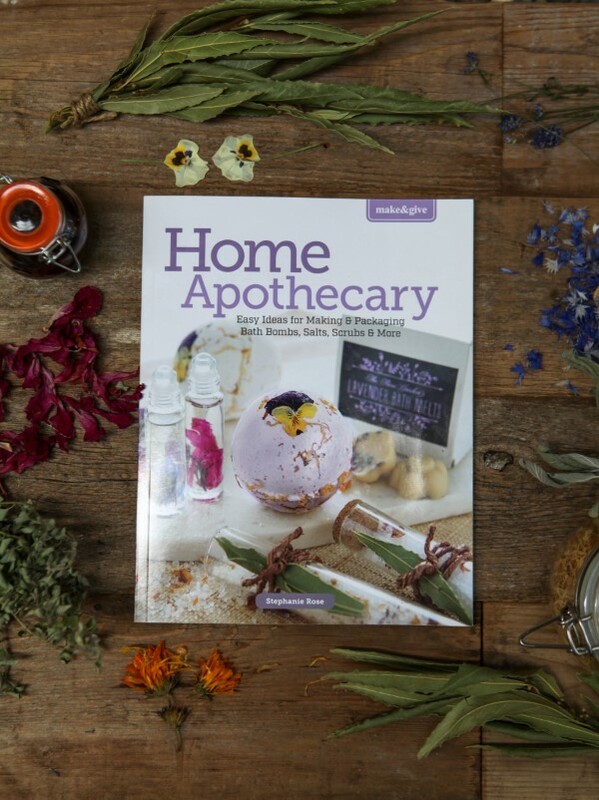 The book outlines the basics of two methods of crafting from your home apothecary: measure and mix, and melt and pour. These two methods are both easy to learn and it means you will be able to make the projects look great the first time you try! Essentially, you measure the ingredients then either mix them or melt them together, and then put them into a mold or jar. 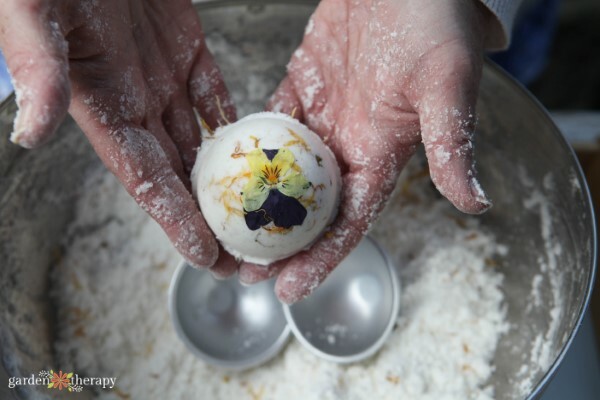 In the book, I show how these simple methods can turn into gorgeous creations. And then I go one step further to offer ideas for how to package them up attractively to give them as gifts. I’m really so thrilled by how beautiful the projects turned out. They all look like high-end artisanal gifts and I know that the recipes work like a dream. Many of these are recipes I have been using for years. 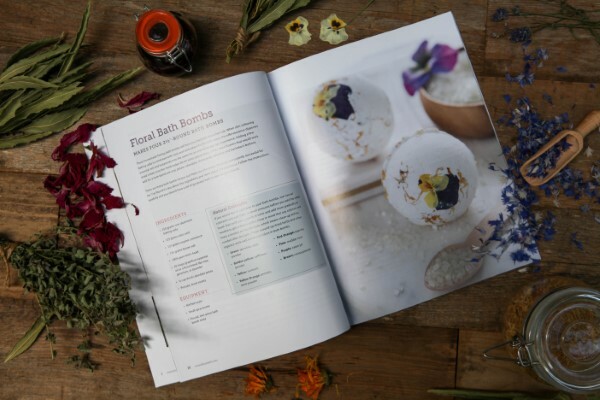 They are my favorite go-to recipes for balms, butters, bath salts, and more. Since I make them all the time, I usually just whip them up for my own home use. Having the opportunity to write this book had me really look at each ingredient in the recipe and tweak it so that it was perfect every time. You know, I surprised myself! Some of the recipes that I’ve been making as a staple around my home for many years got a few improvements that have made them SO. MUCH. BETTER. Like my chocolate mint lip balm, which is my favorite go-to lip balm and has been since 2010. 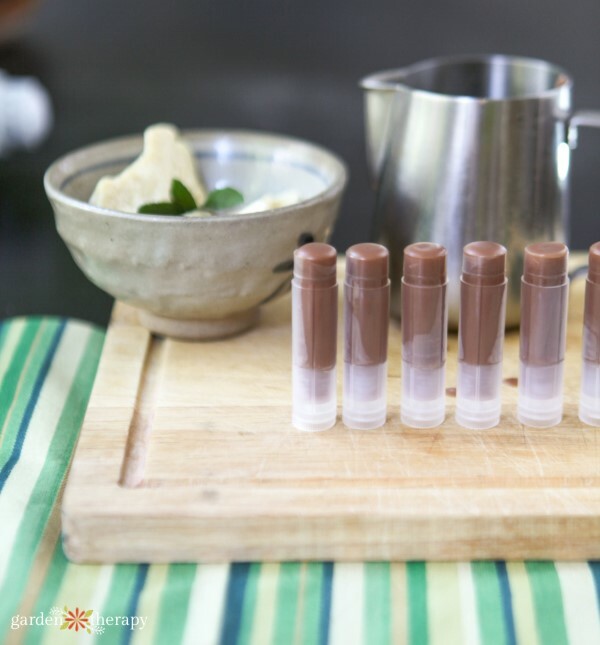 I like that the cocoa gives the faintest hint of color on your lips and that the mint is just slightly cooling. When preparing for this book, I tested out a few modifications to the recipe by swapping out the oils and butters. WOW! A few changes made it even better! 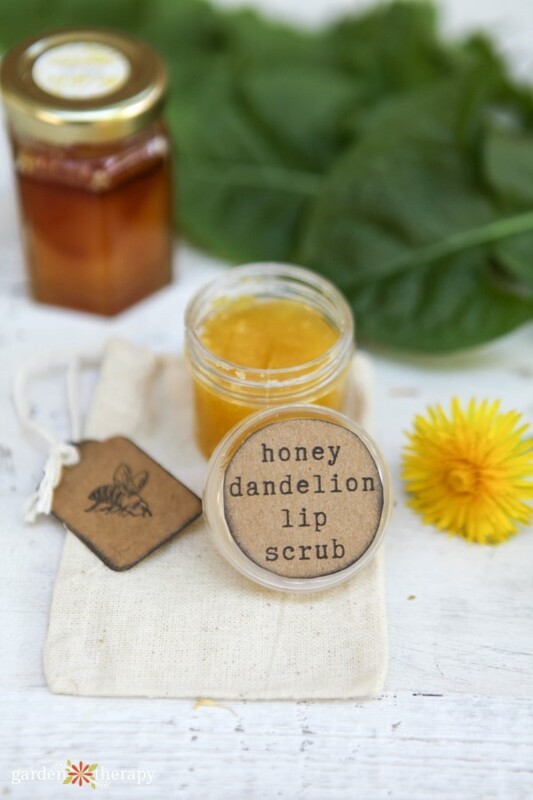 The new combination makes this lip balm feel decadent when it goes on, but absorbs in and moisturizes your lips faster. 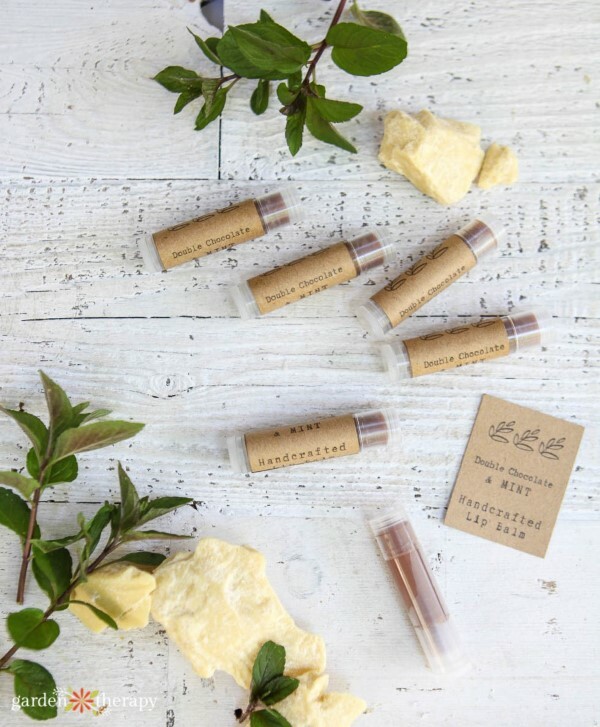 Plus, I found a new brand of organic unrefined cocoa butter that has a heavenly chocolate scent so the lip balm smells so good that you’ll want to eat it. Taking the time to dive deep and refine each one of my favorite recipes is what makes this newest book so special. The recipes are tried-and-true and so easy to make that they’ll make you look good whether you’re using them for yourself or giving them away as gifts. The recipes are great for making in small batches if you just need a gift or two at a moment’s notice. But I also think there’s some great options for scaling these much larger. Imagine a group of friends getting together for a crafting night and making some of the recipes. 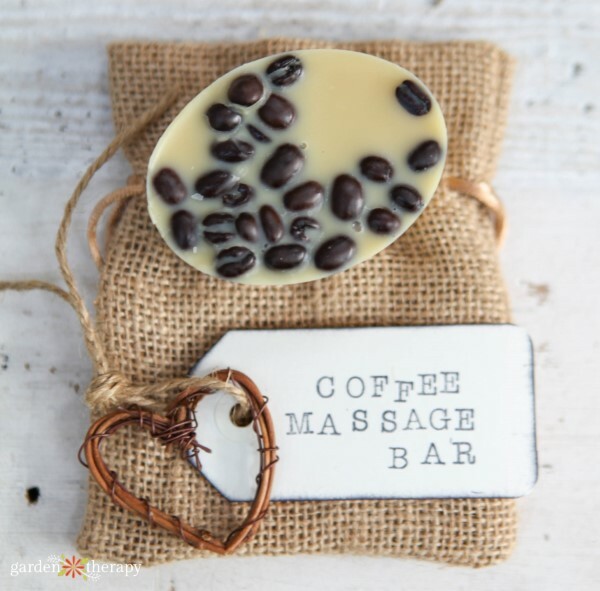 Maybe even making a bunch as wedding or bridal shower favors. 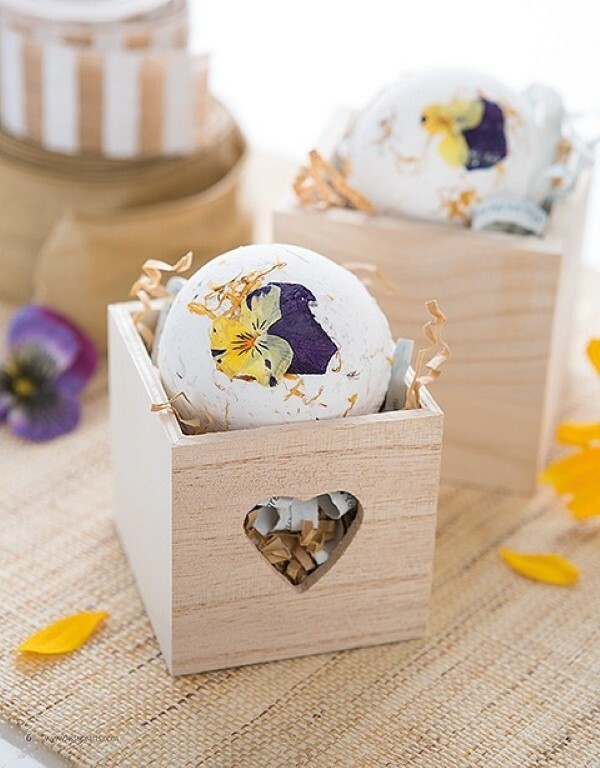 Or perhaps one talented crafter will make them en masse to sell online or at a craft show. I know that what I’d like to do is get together with a bunch of my craft-loving friends to make some of these recipes as a group. I love crafting in a group because of all the ideas you get from those brilliant minds all working together. Now that the book is here, I’ll be scheduling a get together and I’ll keep you updated on how it goes. If you are in Canada, order the book here and I’ll send you a signed copy plus a digital file of the labels I used in the book. Quantities are limited so don’t delay! If you are in the US, pre-order the book on Amazon here and I’ll also send you a copy plus a digital file of the labels I used in the book. If you are outside Canada or the US, then you can order the book directly from Leisure Arts. You can choose a print copy and get an international shipping quote, or download the digital copy instantly. 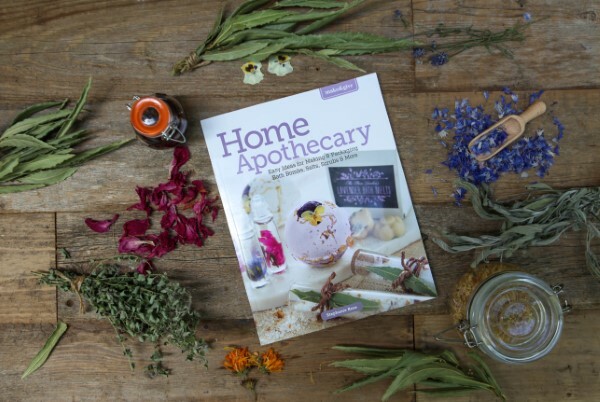 EVERWHERE: Home Apothecary is available as a Digital Download directly from Leisure Arts as well. And if you are in the US, look for it in Michaels stores as of August 10, 2018. I know I’ll be looking for it too and, who knows, I may even pop by a few stores to do some demos and book signings! Beautiful looking book. I loved your first one and can’t wait to see this one. I like your Blog. I appreciate your good information.